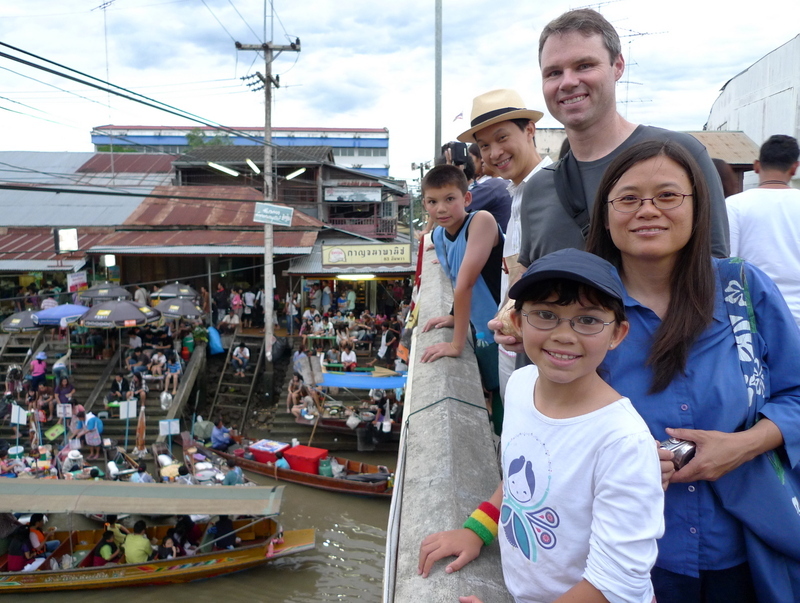 While some guests were in town, we took a trip to Amphawa, a town in Thailand’s smallest province, Samut Songkhram, to visit the weekend evening floating market that is there. 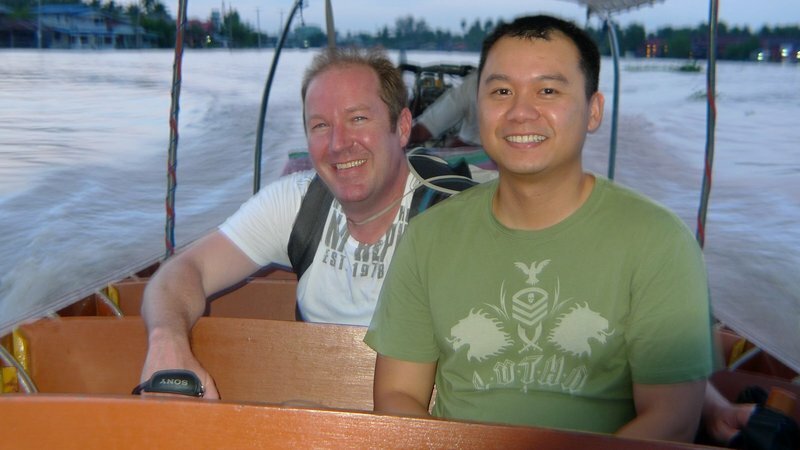 We arrived late afternoon and had no trouble hiring a long-tail boat and heading out on a tour of the khlongs, or canals, of the province. For those of you who have never been, here is a three-minute video with commentary to give you a sense of what such a boat ride is like. Above, a flower vendor about to set out for the market. 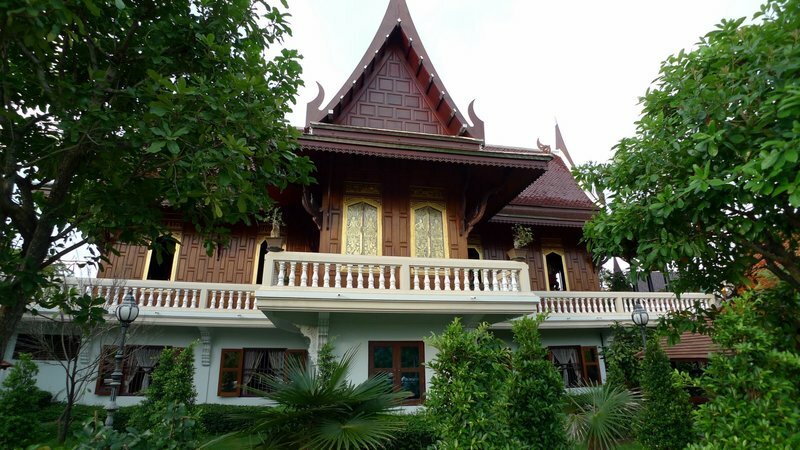 One of the buildings at Wat (temple) Chulamanee. This building, interestingly enough, was not the main Buddha image hall. Instead, it was a recently built building that houses the remains of the temple’s former head monk, who was apparently highly revered. Inside the building there is an altar like display, a wax effigy of the monk, and his mummified body in a glass coffin. Uncommon as in Buddhism bodies are normally cremated, but I’ve seen this a few times before. Wat Bang Khae Noi, another temple on the western shore of the Mae Khlong River. 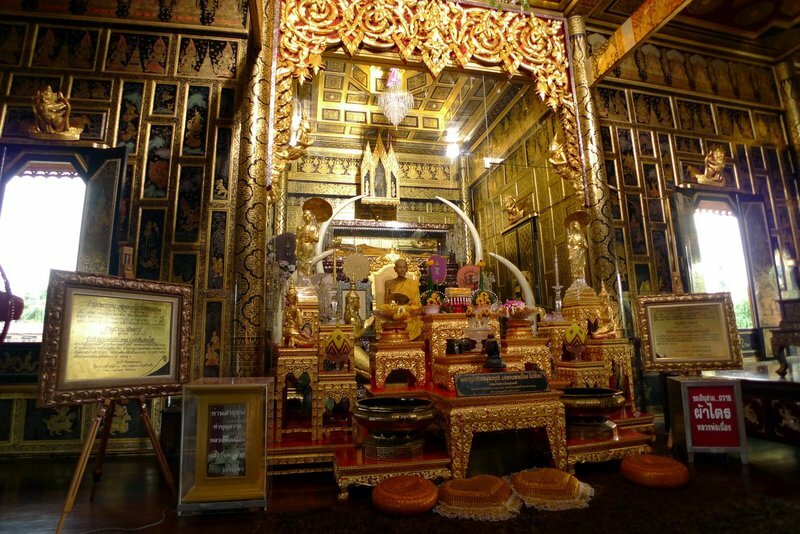 This one has beautiful teak carvings on the interior walls depicting the stories of the Buddha’s previous lives. A new, more modern arrangement of statues at the temple, overlooking the river. The kneeling figures are not Buddhas but are disciples, praying to the Buddha image in the center. On the right is the depiction of a Buddhist angel. This display wasn’t here last time I was at this temple a year or so ago. Bruce and Howie enjoying their ride along the river. Sunset along the Mae Khlong River. 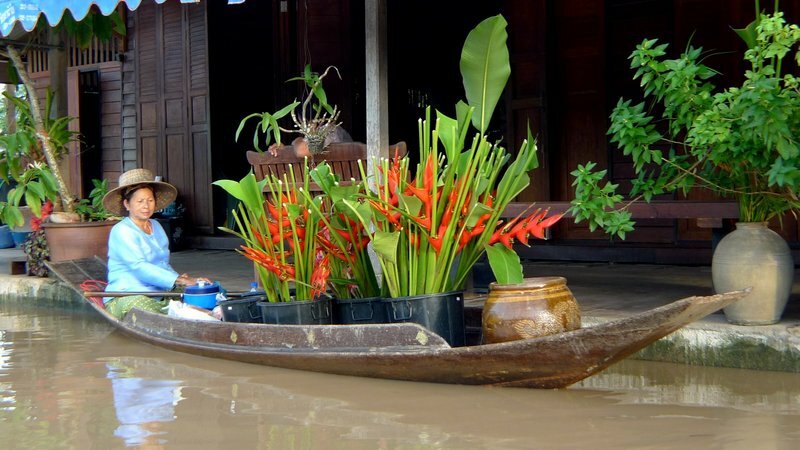 (Note that this is not the same as the Ma Kong River, which runs between Thailand and Laos and Thailand and Cambodia. The flooding in Samut Songkhram province has been very severe. They had just experienced three days of heavy storms and the water level was very high. 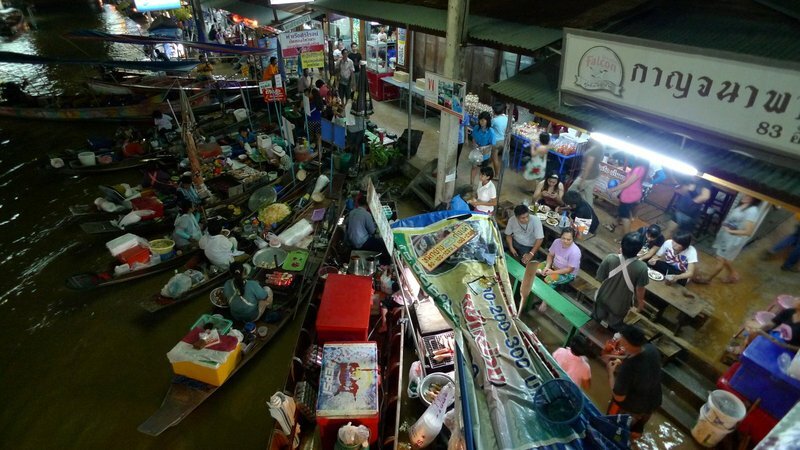 To get an idea of just how high, notice that in the picture above, the customers at the floating food stalls are sitting on benches that go down one or two steps. Compare that to the picture below, taken in July, when there were at least ten or twelve steps above the water, consistent with where I’ve seen it on all my previous visits. This entry was posted in Uncategorized and tagged Amphawa, canal, culture, Floating Market, Khlong, Samut Songkhram, thai, Thailand, Wat Bang Khae Noi, Wat Chulamanee by christao408. Bookmark the permalink. So very sad, mother nature can be so fierce. these are great pictures. what kind of camera do you have? are you using software to edit the pictures afterwards? Loved the tour. I just can’t get over the intricate patterns in the temple carving and statuary… very nice. 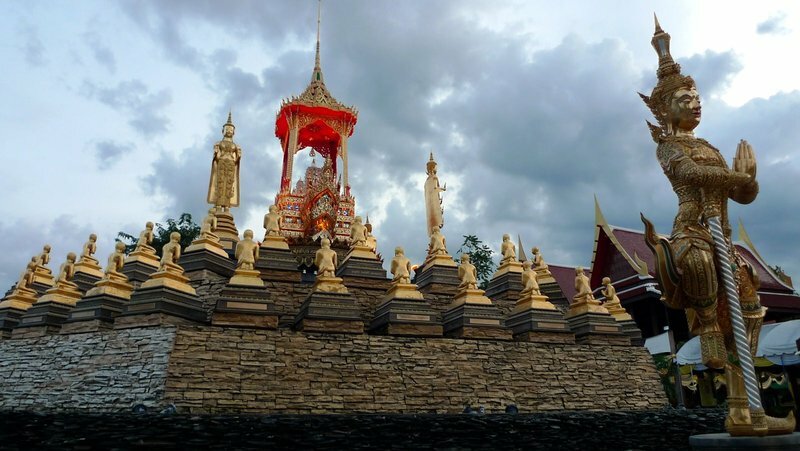 That’s a very nicely built temple, Wat Bang Khae Noi, that’ll make a nice day trip from Bangkok, I suppose? By the way, there’s a super typhoon approaching Hong Kong right now, maybe that’s the reason for the high water level. The water doesn’t look clean in the video. Thanks for the tour and great photos. I do feel for the poor people there. It seem they have nothing and now less. Great pictures and such fascinating structures and statues. I always enjoy your tours! @ThePrince – Glad you enjoyed the video and photos. I shoot with a Panasonic Lumix LX3, which has a very nice Lumix lens with 22mm wide angle and fantastic low-light performance. The files are shot in JPG (not RAW) and the limited processing I do is done using Google Picassa. @foggysunnymorning – The river has a lot of sediment in it, run-off from the flooding and heavy rains further upstream. While I wouldn’t drink straight from the canals and river, people bathe in it, fish from it, etc. with no problem. 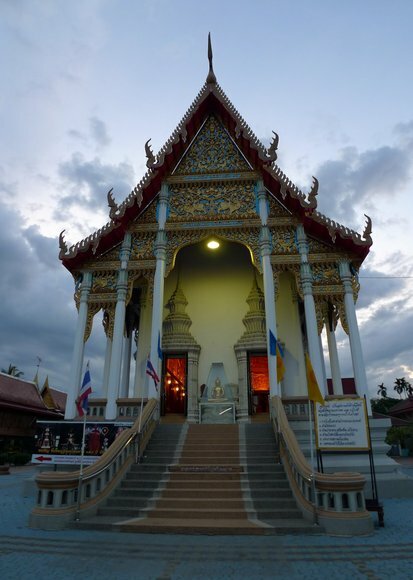 @CurryPuffy – Wat Bang Khae Noi is an easy day trip, especially when combined with the Amphawa Floating Market. Re: the typhoon, I’m glad I left HKG before it, but it had no affect on this flooding, which happened two weeks earlier. @Sinful_Sundae – It is easy to miss traveling, isn’t it? @murisopsis – With the work you do with your orbs, I would imagine a trip to one of the temples would capture hours of your imagination. 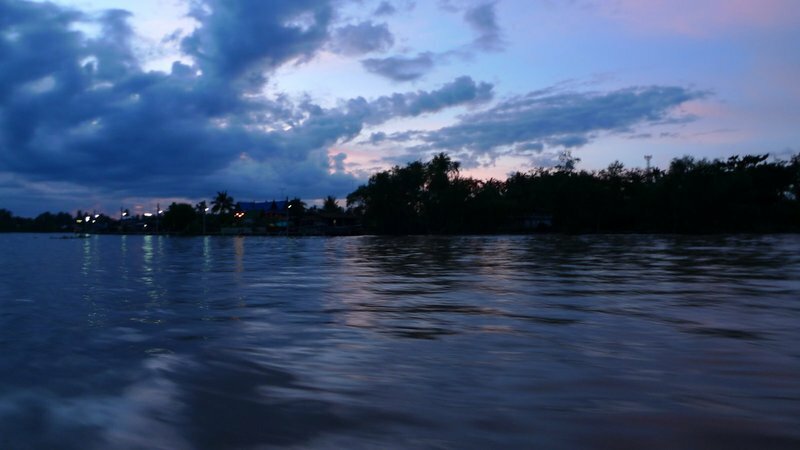 @fortheloveofblogging – The flooding has been very bad this year thanks to a much heavier than normal rainy season, part of the “La Nina” effect in the Pacific. @RakkaRay – @Fatcat723 – Glad you enjoyed the tour. I should do more of them. yes…. it’s an “addiction”. gotta find da right balance btw home life vs travel tho…. so you won’t be missing your bed too much while you are away and won’t be dreaming of paris when you are working in the office. Wow that is a lot of water.